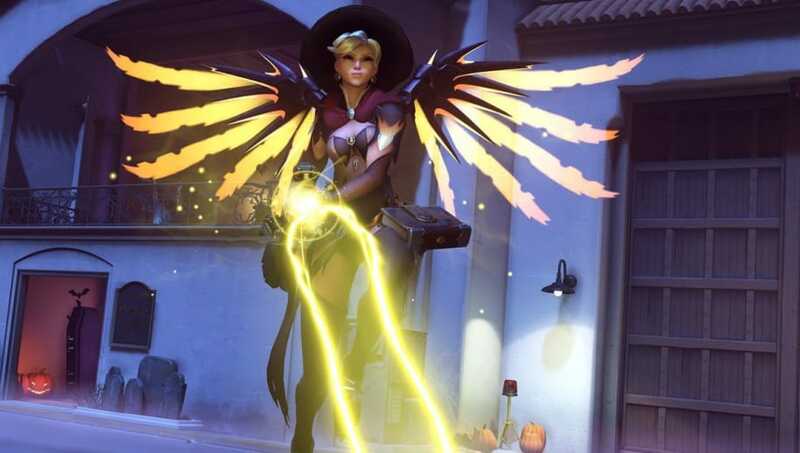 Overwatch voice actress Lucie Pohl, who voices Mercy, said the support hero needs a voice line that responds to the "I need healing" notification in-game. ​​At a "Women of ​Overwatch" panel at Anime Fest last week as part of the New York Comic Con, a fan asked the voice actresses if they have ever suggested anything for their hero that was added to the game or if there was a line they wanted their hero to have. "Yeah, I have one that I'd like to suggest. It's: oh, just go heal yourself!" Pohl said. The voice line suggestion is something Pohl mentioned before, apparently, as she gave the same answer at a previous con in September. Carolina Ravassa, the voice of Sombra, said she was the one who suggested the name Arturito for Sombra's teddy bear. As other fans most likely picked up after hearing the line, Arturito is a joke for Spanish-speaking families who mishear R2-D2's name from Star Wars. Overwatch lead writer Michael Chu loved the idea. Jen Cohn said she told Blizzard to make a skin with flame boots, to mirror boots Cohn wears in real life. Blizzard has yet to make a flame skin for Pharah, however. During the panel, Symmeta's voice actress Anjali Bhimani spoke about ​promoting diversity in gaming and gave fans advice on how to combat toxicity.